Fatah leader mocks Israel as murderers are freed, says prisoner release is Israel’s defeat. Abbas Zaki, speaking for Fatah, mocked Israel in a speech that was translated by the Palestinian Media Watch (PMW) organization. He began by praising the killers’ release as a sign of defeat for Israel. “How great what President Mahmoud Abbas has done, who through his insight knew how to defeat the enemies,” he declared. “No one expected that Israel, which hands down life sentences and decided that they [the prisoners] would go from prison to the grave, [would release them],” he said. “We say to Israel: Die in your rage. Go to your cemeteries and recite over your dead whatever you recite. Here they are [who Israel said] 'have blood on their hands' (i.e., murderers); here they are [back] among their own people: fighters, knights, free men!" Zaki continued. The freed killers “have become medals of honor on the chest of this nation,” he declared. Zaki was honoring three freed killers in particular: Mustafa Ganimat, Ziyad Ganimat, and Muhammed Mukabal. The Ganimats murdered Meir Ben Yair, 33, and Michal Cohen, 32; both victims were survived by young children. Mukabal took part in the vicious murder of his employer, Yaakov Shalom. The three freed killers, all residents of the Hevron region, were given awards by the Hevron District and PA Security Forces, Fatah in Hevron, and the PA Ministry of Prisoners Affairs. 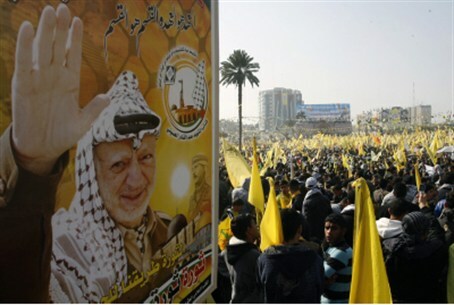 The Fatah movement is headed by PA Chairman Mahmoud Abbas, who has agreed to negotiate with Israel. While Abbas’ negotiations team meets with Israel, Abbas continues to praise terrorists, including many who have committed murder. Fatah’s “militant wing,” the Al-Aqsa Martyrs’ Brigades, recently declared open war on Israel over Jewish prayer on the Temple Mount.